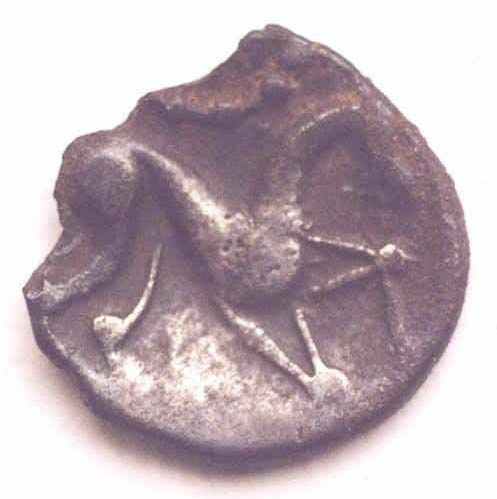 Iron Age silver North Eastern Boar/horse unit, 15mm in diameter. One edge is badly damaged (Hobbs 3224/VA877). Obverse description: right facing horse with pellet above. Iron age silver North eastern unit, Boar/horse type, VA877, Hobbs 3218. Iron Age silver unit, North-Eastern boar/horse type, Hobbs 3224. Iron age silver North Eastern Boar/Horse unit. cf VA877.